While I was down in Melbourne I participated in a few little projects, one of which launched on Friday so I can finally share it with you. I was asked by Anthony Capon, of Project Runway Australia fame (he was the winner of season two) to model in the label he designs for, Et al's AW lookbook campaign for their 'Breakdown' collection. I said yes straight away as I loved the concept, which Anthony explained as "Basically our campaign is going to be like the infamous United Colors of Benetton ads of the 90's I guess, showing that our label is not specific to any age, size or gender." 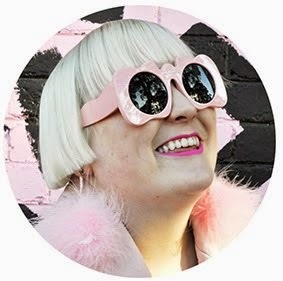 With people from all walks of life featured in the campaign, from the iconic Australian fashion designer Jenny Bannister to retail managers, art gallery directors, stylists and bloggers with the youngest participant at 20 and the oldest at 80 I am honoured to be featured. "Et al’s philosophy is that regardless of age, size or gender, any person when put in the right clothing, can look and feel incredible.The campaign for Et al’s Autumn Winter collection highlights the one essential characteristic of all of our clients which is the love of eccentricity and style, quality workmanship, and unique and sophisticated designs.Wanting to break down any stereotype of who the ‘ideal’ Et al client is, instead of using a professional model, we’ve chosen people of all ages, different sizes, male and female, with various occupations and backgrounds.The campaign is simple. It is everything that Et al believes in. size, age and gender become irrelevant when it comes to style." Et al are currently holding a facebook competition to win one of their fabulous AW coats. To enter simply like their page. You can check out the full campaign imagery here. Love your outfit post the BEST. What an excellent concept, I love the idea, if only more brands thought like this. Love the collection out here..Waiting eagerly to see something more from you .. Fashion trend diversity is countless and varies according to seasons..Since change in fashion is inevitable.. Keep Sharing !!! Great ad! So glad you got to be a part of it. And random question while I'm on this post..Do you know who the taller guy is standing behind the camera in the shot with two people behind a camera? I believe he was doing makeup backstage when I modeled for Japan fashion week! I thought I recognized him from something...Is he a Project Runway Australia guy, or a MAC makeup stylist?